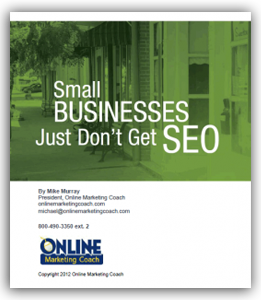 An astonishingly high number of small businesses don’t do so well with search engine optimization (SEO). In our study, “Small Businesses Just Don’t Get SEO,” we found that 62% don’t rank for a single word on Google’s first page. And that was a generous finding because most of the 200 web sites we evaluated weren’t using even the most fundamental SEO tactics. We couldn’t see what keywords they were targeting because they weren’t in the page titles and meta data. We literally put some keywords in motion based on a review of their location and content. They weren’t ranking even for some of the least competitive keyword phrases. The report covered SEO basics, including tips on rankings higher. We also explored link building, social media and noted whether small business owners had invested in paid search. A healthy number of small businesses actually had content they could leverage, decent domain names and some respectable inbound links from other web sites.